When my mother learned I was going to move to England, she sighed and said “my two expat daughters…” My sister has been living in Toronto since she arrived at the University of Toronto in 2005. I haven’t lived anywhere that long as an adult, and it was kind of inspirational to see how well she knew the city. Since Cambridge is much smaller than Toronto, I’m confident I can gain that kind of knowledge here in a couple months…right? My bike got TWO flat tires (tyres) simultaneously the other day and is in the shop right now. On Friday, Izzy and I went to Guu, a super trendy Japanese Tapas place in the gaybourhood (I don’t know what its actually called, I think it has an official name). The first thing that came to our table was sea urchin, something I had specifically requested that we order (I’d never had it before). Aaaaaand…it was awful. If you added a metric crap-ton of wasabi, it was okay, but still didn’t portend well for the rest of the night (I should add that we waited over an hour for a table and we were both really hungry by the time the food came). Thankfully, the rest of the meal was amazing: beef salad, bimbimbop, calamari, fruity cocktails, and deep-fried brie with mango and blueberry sauce, which Guu is apparently particularly known for. Afterward we went to a bar a few blocks away, and Izzy’s boyfriend joined us for a drink. 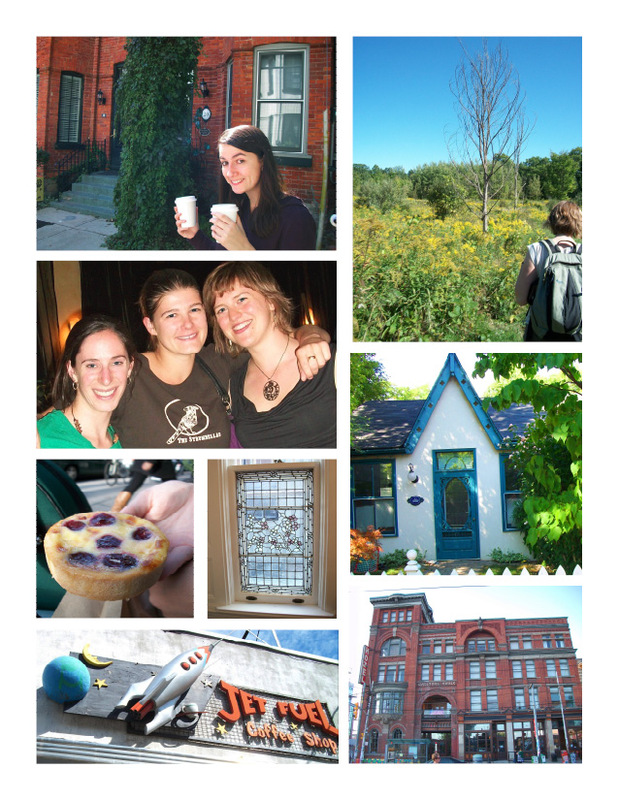 On Saturday, we went to Jet Fuel Cafe, which has fantastic signage, and then walked around the very scenic Cabbagetown neighborhood. We also went to a bakery called Clafouti (a custard tart that’s apparently really easy to make) and sampled the eponymous item. One of the highlights of Saturday – for both of us, I think – was that we stopped into a real estate open house for a $1 million three-story home. We were among the first people to get there, and the house was full of incredible original details – ceramic tiles on the fireplaces, antique Tiffany glass on the windows, elaborate Art Nouveau brass on the door hinges. Nevermind that I don’t live in Toronto. If I had $1 million, I would have spent it on this house. That night, I was joined by my two Torontonian friends Laura and Deb – Deb had been moving to a new apartment all day and had battled a couch stuck in the doorway, and I’m really grateful to both of them for coming. Laura and I got dinner at the Gladstone and then all three of us met up at the Rhino, a hipster haven a few blocks away where my sister’s band, the Strumbellas, was playing as part of the Queens West Arts Festival. On Sunday, Izzy and I ran the Yorkville B & O 5k race, and despite the beer we’d consumed the night before, we both PR’d. I had an 8:07 mile split, which isn’t exactly lightning-fast, but its faster than I’d ever run in a race before. That afternoon, we went to the Rouge Valley for some hiking (it was a perfect late-summer day – I’ve been so lucky to take advantage of so many of those lately). It was an amazing weekend. I’m super grateful to have had the chance to see my sister (whom I hadn’t seen for NINE MONTHS), and I’m so glad I was able to see Deb and Laura as well. Also, my sister’s boyfriend slept on the couch and in so doing won me over forever. Well played, Jeff. And thanks everyone!